With the UK set to have one of the hottest and driest summers on record, most of us are relishing the opportunity for sunbathing and al-fresco dining. But what does this temporary change in climate mean when it comes to feeding our horses? Although your field may look bare, if your horse or pony is overweight and you are picking up a similar number of droppings feeding additional forage may not be necessary. When grazing is sparse, it’s possible for your horse to eat fresh growth even if you can’t see it. A good way to assess grass growth is using your lawn as barometer or fencing off a small area to see how much growth there is. 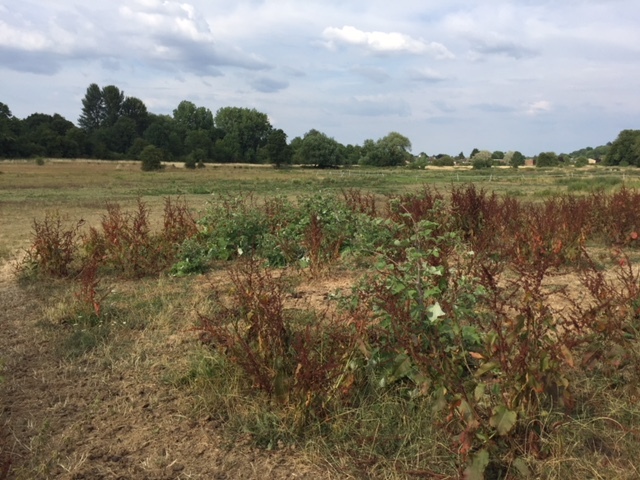 Yellow grass may not look particularly appetising but if there is enough available it will have a similar energy level to hay which is more than enough to sustain many horses. For those that are losing weight or if there isn’t enough grass available to meet minimum fibre intake guidelines additional forage will be required (see point 4). 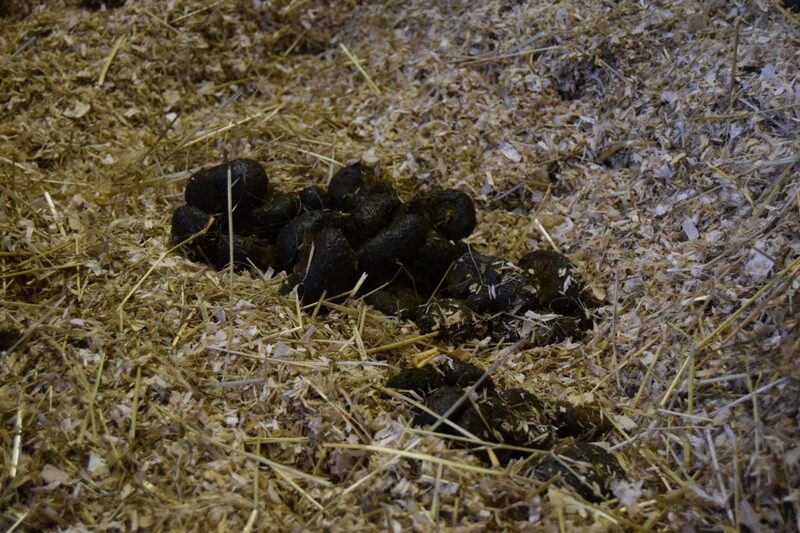 Watch out for sand (or soil) colic! The risk of colic as a result of eating sand or soil is much higher in horses grazing close the ground. If coverage is very sparse consider feeding hay or a low calorie hay replacer, ideally in a net, feeder or bucket rather than from the ground. Scorched grass can be high in fructan (stored sugar)! Whilst drought and overgrazing inhibits growth, grass continues to produce sugar in sunny conditions. When it can’t be used for growth, this sugar is stored in the stem as fructan presenting a hidden danger for laminitics. In fact, when eaten close the ground, the proportion of stem (and therefore fructan) per mouthful of grass could be significantly higher. Although this may be offset by there being less grass available, high levels of fructan may still increase the risk of lamintis and also colic. If your field now resembles a desert and you need to replace your horse’s forage intake, total intake should not be restricted to less than 15g per kilogram of bodyweight (equal to 1.5% bodyweight) per day on a dry matter basis. All forage contains some water so in practise, this means feeding approximately 9kg of hay or 10-12kg of haylage for a 500kg horse with no grazing. If excess weight gain is not a concern, hay or haylage can be fed ad lib. If hay or haylage isn’t available consider using short chop forages such as SPILLERS Happy Hoof or SPILLERS Happy Hoof Molasses Free to supplement their intake. Although potentially more effective at reducing the water soluble carbohydrate (sugar) content, soaking for long periods causes a rise in bacteria which may be exacerbated in hot weather. Soak for 10 minutes to swell dust spores or alternatively consider steaming which is more effective at improving hygienic quality. 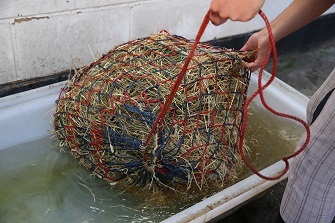 Soaking hay, regardless of time or water temperature does not guarantee suitability for laminitics. Short chop hay replacers such as SPILLERS Happy Hoof and SPILLERS Happy Hoof Molasses Free that are low in calories, starch and sugar are ideal for laminitics and good doers. Alternatively consider having your forage analysed for water soluble carbohydrate (WSC = sugar + fructan) which should ideally be less than 10%. If you normally rely on summer grazing for weight gain, you may need to consider introducing a feed alongside ad lib hay or haylage. 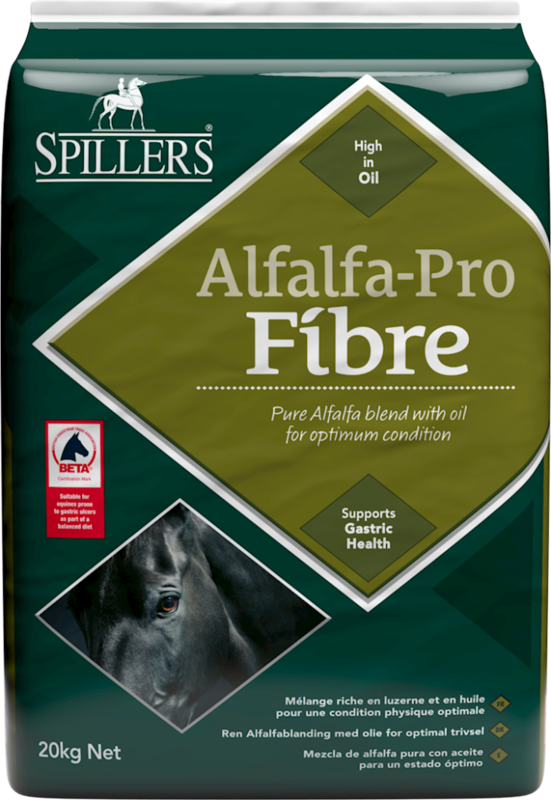 High oil, short chopped fibres such as SPILLERS Alfalfa-Pro Fibre contain the same level of calories as a conditioning feed, but also provide the added advantage of increasing fibre intake and extending eating/ chewing time. Once mixed with water, feeds can quickly ferment in hot weather. If required, quick soaking mashes and sugar beet are ideal in hot weather and should be fed immediately after soaking. Electrolyte losses are directly related to sweat loss so provided they have sufficient forage, the majority of leisure horses won’t need additional electrolytes. Forage is naturally high in potassium and even if fed at minimum requirements, average hay will exceed daily sodium and chloride requirements for horses in light work. For those sweating on a regular basis, table salt (the salt you put on your chips!) is an effective way of providing additional sodium and chloride. Requirements vary according to sweat loss but for most horses, ¾ – 3 tablespoons (13-51g) per day is sufficient. Although your grass (or what’s left of it!) may still meet or exceed your horse’s energy (calorie) requirements, it is unlikely to provide a balanced diet. 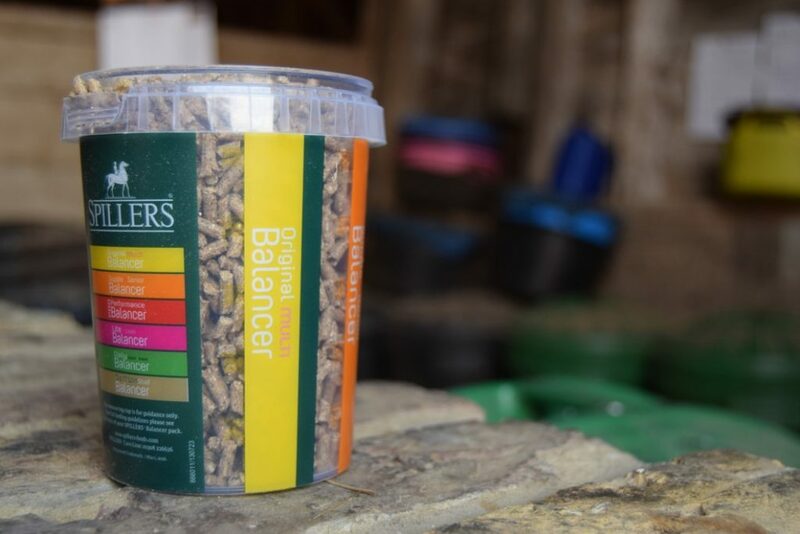 If you’re concerned about your horse’s waistline, a balancer is the ideal way to provide additional vitamins, minerals and quality protein without excess calories. 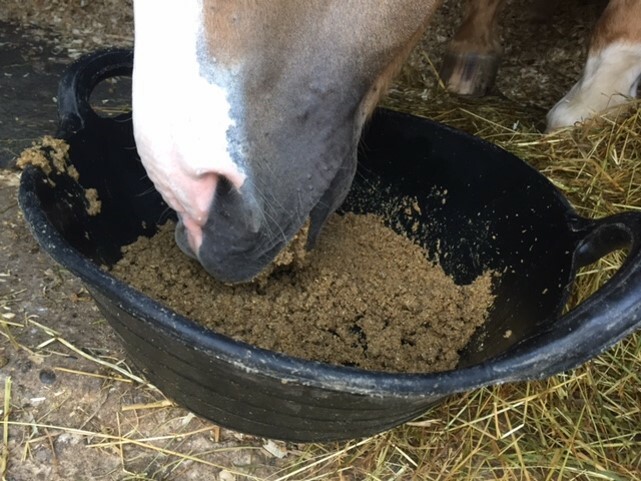 Low calorie chaffs such as SPILLERS Daily Fibre can be used to bulk out the bucket and extend eating time without compromising your horse’s waistline! Fresh grass contains approximately 80% water and under normal circumstances, goes a long way in meeting requirements for horses turned out to pasture. 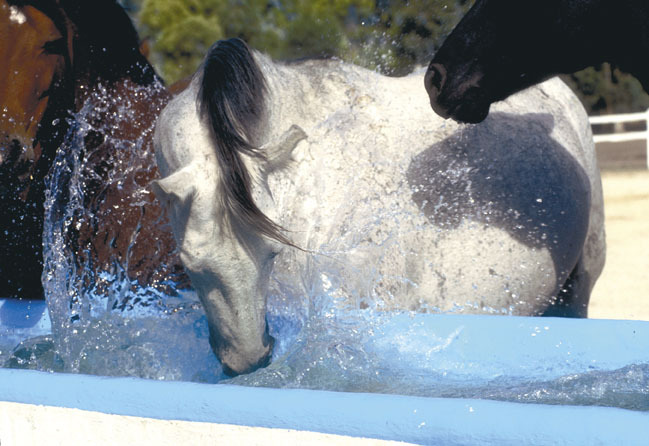 At rest, a 500kg horse will typically drink approximately 25 litres of water per day but this could more than double when soaring temperatures have scorched the grass so make sure clean fresh water is always available. Using soaked feeds such as SPILLERS Speedy-Mash Fibre is a great way of getting extra fluid on board not only through the feed but soaking feed has also been shown to increase water intake. Take care when the rain arrives! When the rain inevitably arrives there will be a rapid increase in grass growth and consequently intake, increasing the risk of laminitis, weight gain and colic. Consider restricting grazing for good doers and for very laminitis prone horses and ponies, removing grazing completely.